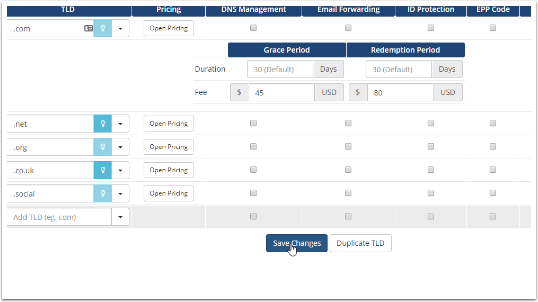 A major feature included with WHMCS version 7.5 and higher is Domain Redemption Fees. This means you will now be able to configure an automated charge to renew expired domains during the domain grace period and redemption period. On this page, choose the Settings Gear icon, next to the TLD you wish to setup the Domain Redemption Fees for as shown. The next step is to specify the grace period in days you wish to offer (if any). By default, most TLDs have the grace period activated with default values and it is set to $0. The price entered is always done in the default currency and will be auto-converted to any other default currencies configured, based upon the exchange rate. In order to activate the redemption period, you would need to update the redemption period days as well as specify a price. Once happy with the settings, choose Save Changes at the bottom of the page. Note: To disable either the Grace Period or Redemption Period, simply clear out the price fields and choose Save Changes.